LibreOffice, the popular open source office suite, received a major update Wednesday with the release of version 5.0, which adds a host of new features and compatibility with Windows 10. The refreshed suite has an overhauled user interface, including a redesigned Start Center that provides easy access to recently edited documents and the ability to create new files. LibreOffice 5 also includes improved support for importing files produced in other applications like Apple's Pages word processor, and the MacDraft drawing and drafting tool. Writer now supports exporting highlights and shading that's compatible with Microsoft Word. Calc, LibreOffice's Excel replacement, received a number of improvements, including support for engineering notation, repeating item labels in pivot tables, and "Floor" and "Ceiling" spreadsheet functions. There are also a handful of new features designed to make Calc play nicer with Excel. 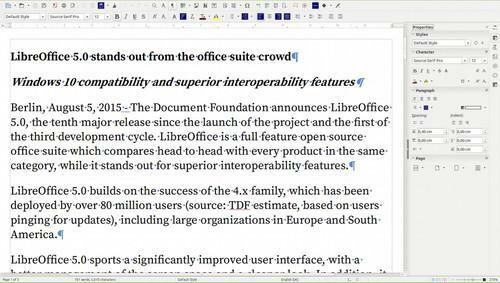 In addition to the new features, Italo Vignoli, one of the founders of the Document Foundation (which oversees development of LibreOffice), said that the recent version is the most reliable edition of LibreOffice yet. Contributors to the project have solved more than 25,000 bugs. That's key for a suite that is being marketed to enterprises, which don't want to see employee productivity lost as a result of buggy software. Importantly, the update also makes LibreOffice compatible with Windows 10 a week after Microsoft launched the update to its operating system. LibreOffice 5 is also available as a 64-bit application for Windows users who have Vista or above installed on their machine. The release also brings basic editing features to LibreOffice for Android, which makes it possible for users of Google's mobile operating system to tweak their documents on the go. Prior to the release, the LibreOffice Android app only supported viewing files, and users couldn't modify them. Users who want access to all the latest and greatest features in LibreOffice 5 can download it today. Businesses and other users who want to be more conservative are encouraged to stay on LibreOffice 4.4.5, a minor release that was pushed out last week. Moving forward, the Document Foundation will be working on scheduled releases, rather than waiting to complete certain features before pushing out a new update. That change means users will likely see fewer groundbreaking updates, but customers will be able to expect when changes will arrive and prepare for them. The Document Foundation estimates that more than 80 million people use LibreOffice, including large enterprise and government installations. That's an impressive number, but likely much smaller than the total installed base for Microsoft Office. While Microsoft doesn't offer comprehensive details on how many Office users there are in the world, the company claims that there are 1.5 billion Windows users overall. If even half of those people use Office, they would be slightly less than 10 times the size of LibreOffice's user base. Vignoli said that LibreOffice exists as an "alternative" to other suites like Microsoft Office, and there will always be a population of users who turn to its closed-source competitor. "We are not here to wipe Microsoft out of the market, which would be impossible anyway," he said. Moving forward, LibreOffice 5 will be the foundation for mobile apps on Android and Ubuntu Touch, along with a Web-based version that will eventually feature live collaborative editing similar to what Microsoft and Google offer with their respective office suites. "We look forward to having a full editing feature version for Android around the end of the year, to have a LibreOffice online version around the end of the year -- let's say the first months of 2016 -- and to add collaborative editing during 2016," Vignoli said.